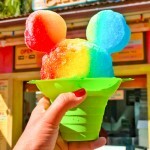 From Magical Stars Cocktails to Lime Frozen Margaritas, follow our Guide to Drinking Around the World at EPCOT in Walt Disney World! Hi friends! 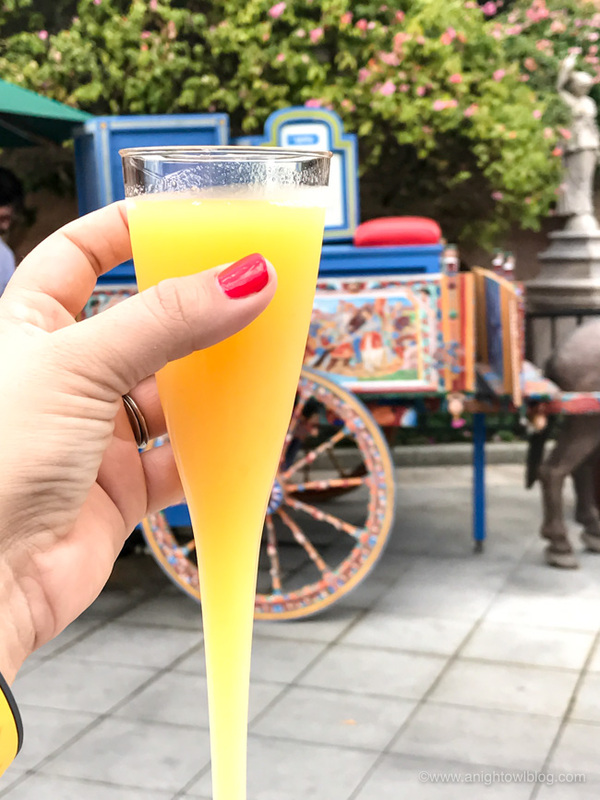 I’m so excited to talk about one of my FAVORITE Walt Disney World activities – Drinking around the World in Epcot! Especially on an adults-only trip, Epcot is one of our favorite stops. 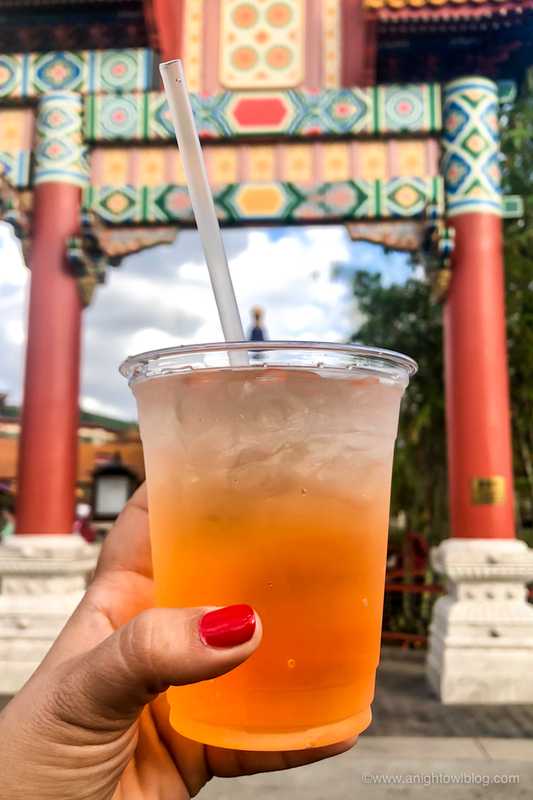 We always enjoy wandering around the World Showcase and trying new eats and drinks, so we’re going to share some of our favorites with you today! 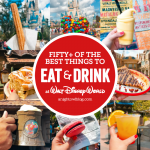 FIRST, SOME TIPS: Before “drinking around the world,” be sure you are well rested and well hydrated. Stop and eat a full meal before you begin (like a hearty buffet breakfast). During your day there, make sure you continue to eat, preferably a little snack with each drink, which is more fun anyways right? Stop for lunch or dinner along the way. And especially on warm days, make sure you’re asking for a water at each stop too to stay hydrated. Also, my favorite tip? ORDER ONE DRINK at each stop and share! If there’s just two of you, that’s just 5 1/2 drinks through the showcase instead of a full 11. And if you’re in a group, you could order a couple different drinks at each stop and try new things! Also, I know this is counter to how a lot of people travel the World Showcase, but we like to go counter-clockwise! We always start at the Canada Pavilion and end at the Mexico Pavilion. A couple reasons, first we like to start out with beers from Canada and United Kingdom, which is a good warm-up. 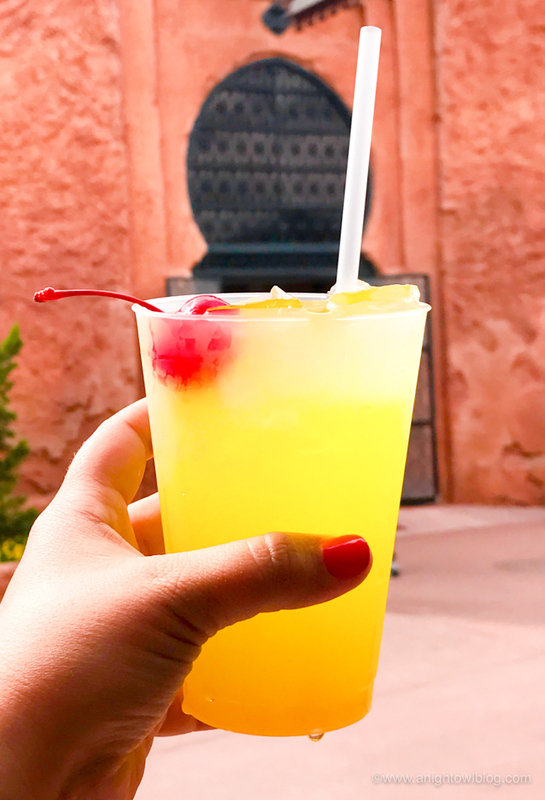 Second, if you like tequila or the margaritas from the Mexico Pavilion, those can be STRONG and compromise your chances of making it around the whole showcase – are you feeling me? But really you can go any which way you want, just offering my two cents. Now let’s get into it! 1. CANADA PAVILION | Magical Star from Le Cellier Steakhouse. Now this one is FUN! 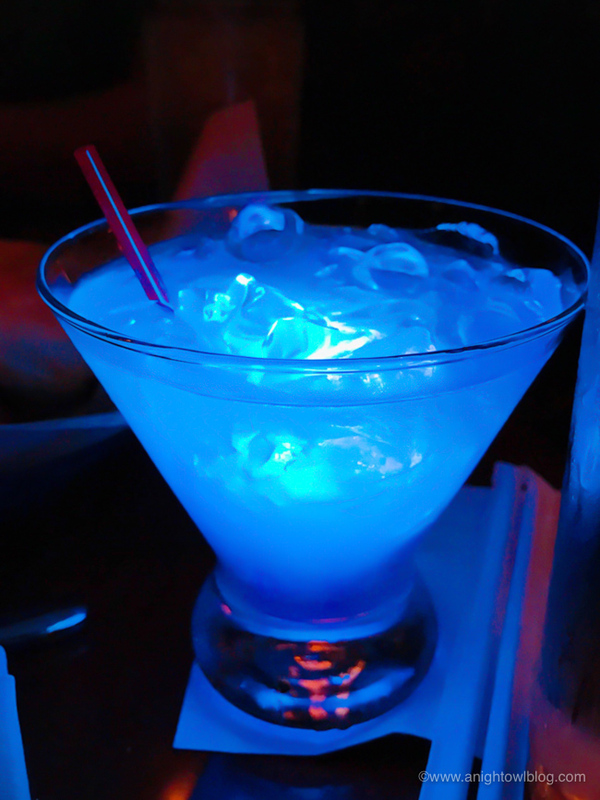 Light up your meal with X-Fusion Organic Mango and Passion Fruit Liqueur, Parrot Bay Coconut Rum, Pineapple Juice AND a flashing souvenir glow cube! Souvenir, because you get to take the flashing cube home with you! I recommend this drink if you’re sitting down to eat at Le Cellier. If you’re just stopping by, grab a Canadian Beer from the cart outside! 2. UNITED KINGDOM PAVILION | Pub Blends from Rose & Crown Dining Room. I opted for the Snake Bite, which is half Cider and half Harp. Andre got “Carl’s Blend,” half Harp and half Becks. Carl is a Cast Member at Rose & Crown that we’ve seen a few times now. We always make a stop here and get a pint, it’s tradition! 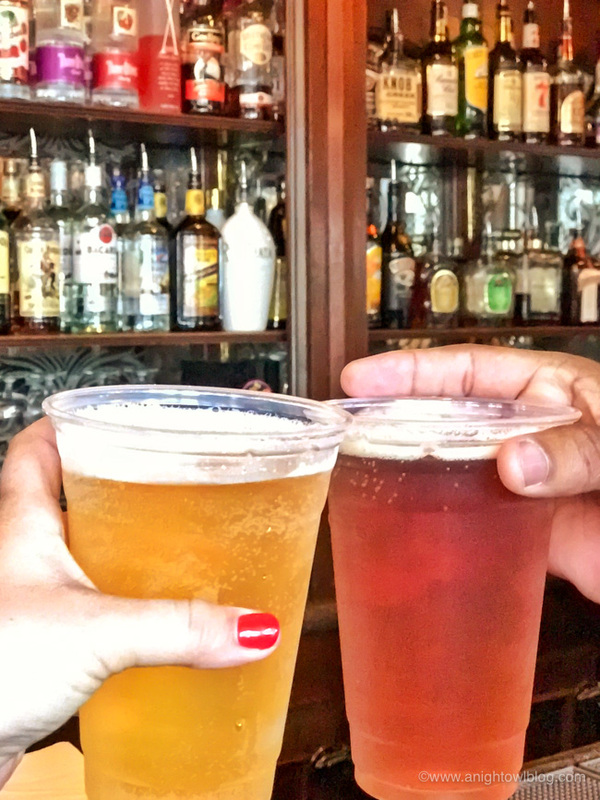 They have a number of other pub blends on their menu, so make sure you stop by and try one! If you’re not a beer fan, I also hear that Carl makes a mad Bloody Mary! 3. 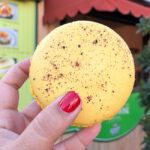 FRANCE PAVILION | Grand Marnier Slush from Les Vins des Chefs de France. 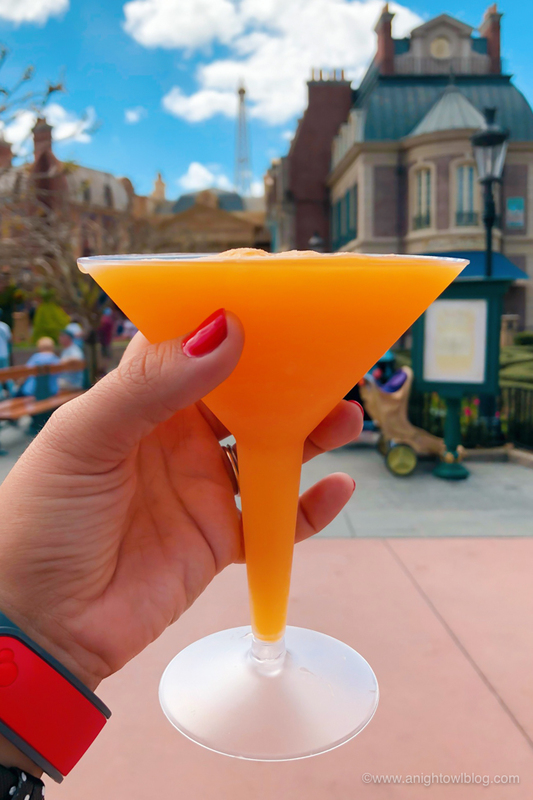 Made with Grand Marnier, Rum and Grey Goose Orange and Orange Juice – these slushies are a fan-favorite! You’ll see plenty of folks walking around with these glasses near the France Pavilion. 4. MOROCCO PAVILION | Tangier’s Breeze from Spice Road Table. I think I could spend a whole day in the Morocco Pavilion! It’s so pretty and the type of food is right up my alley. It’s on my list. But for now, the Tangier’s Breeze (recommended by the bartender) with Peach Vodka, Midori, and Pineapple Juice is delicious and refreshing! Perfect for a World Showcase pit stop. 6. UNITED STATES PAVILION | Buffalo Trace Frozen Coke from Liberty Inn. 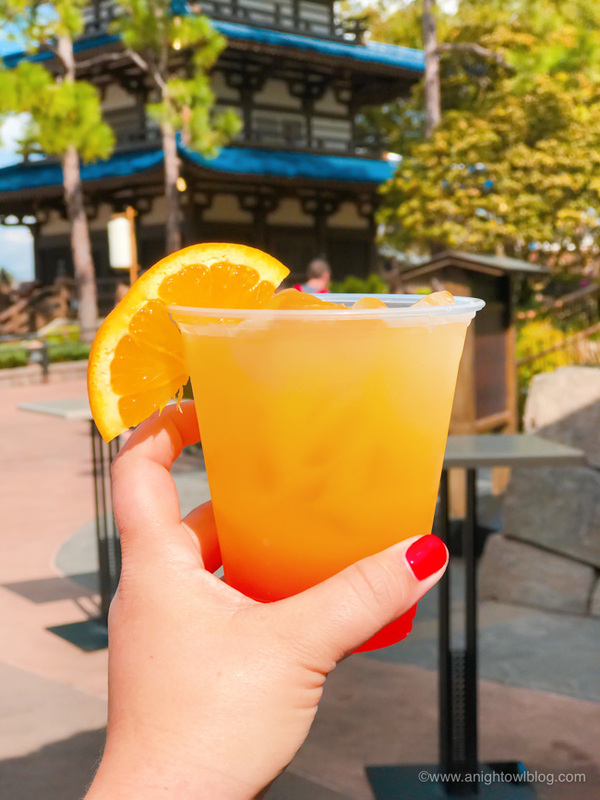 This Frozen Coca-Cola Slushy with a float of Buffalo Trace Bourbon is a newer addition to the Liberty Inn menu, but especially worth it on a warm, sunny Florida day! 7. ITALY PAVILION| Limoncello Cocktail from Via Napoli Donkey Cart. If you’re a limoncello fan, this cute, bright little donkey cart outside of Via Napoli is a must visit! They only serve a few cocktails but you’re sure to find what you like – this Limoncello Cocktail packs a punch. Sit and sip as you people watch from the streets of Italy. 8. GERMANY PAVILION | Altenmünster Oktoberfest from Sommerfest. 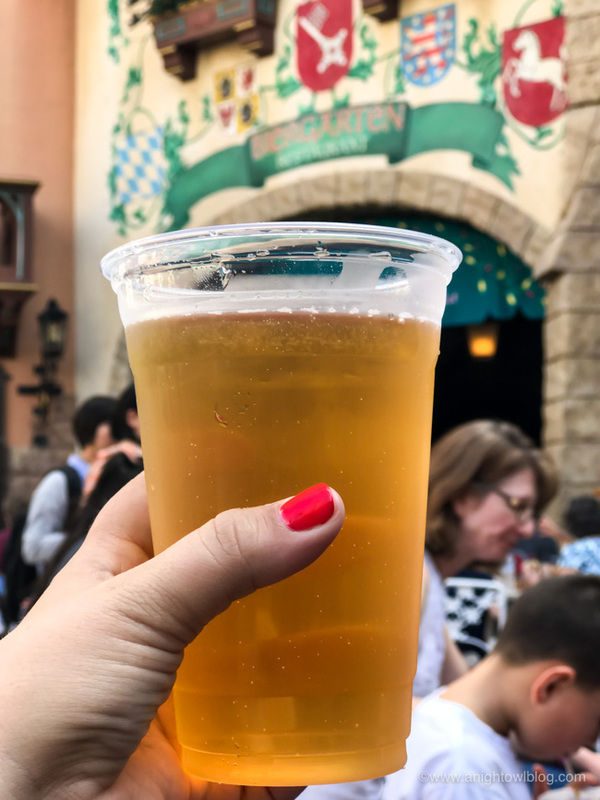 Ok, I know you were thinking WHERE IS THE BEER during our last two items from the Germany Pavilion, and we’re finally here. You of course have to try the beer. There are many varieties (even more in bottled form) for you to choose from and the one we enjoyed was the Altenmünster Oktoberfest. I hear the Schöfferhofer Pink Grapefruit Hefeweizen is also very popular. Prost! 9. CHINA PAVILION | Canto Loopy from Joy of Tea. Made with with Vodka and Cantaloupe Juice, this cocktail is sure to be a surprise treat on your visit around the world! 10. 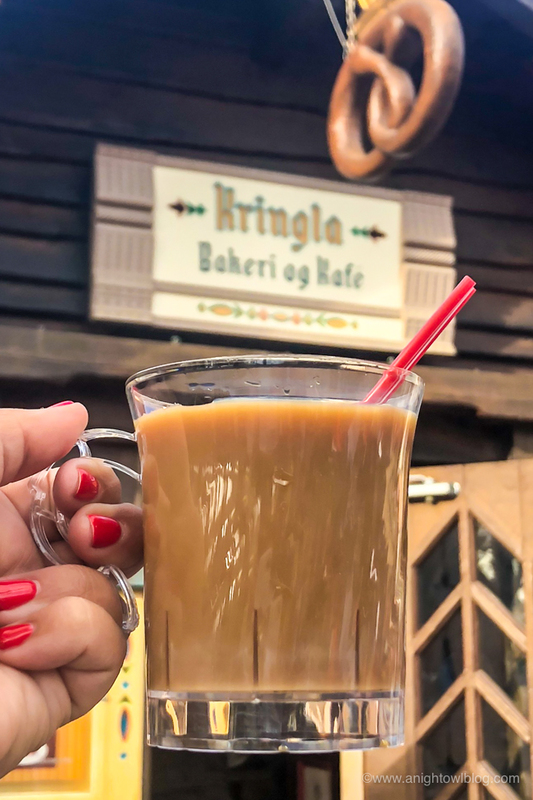 NORWAY PAVILION | Viking Coffee from Kringla Bakeri Og Kafe. 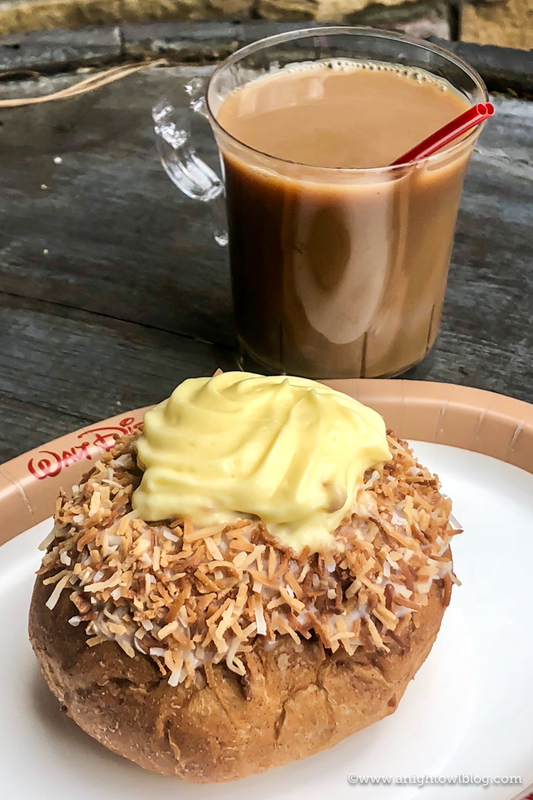 This amazing coffee cocktail flavored with Kamora Coffee Liqueur and Baileys Irish Cream pairs perfectly with the fan-favorite School Bread. 11. 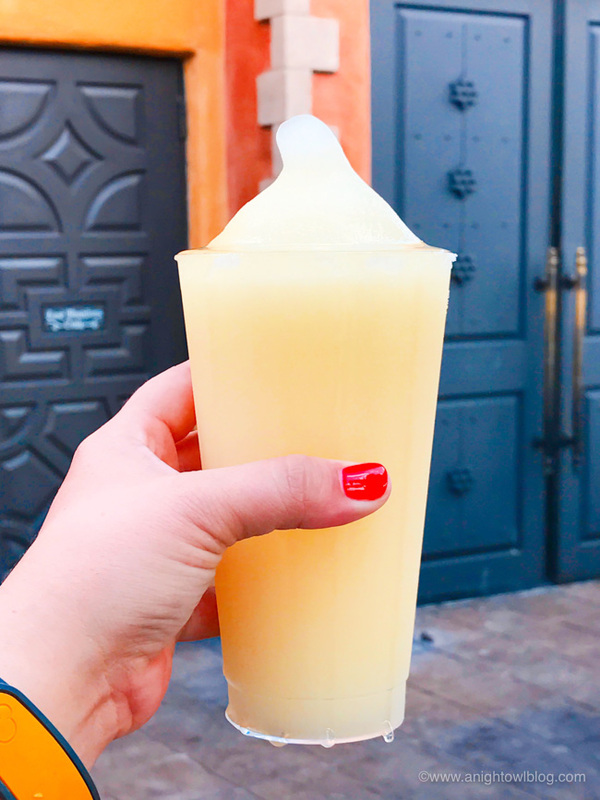 MEXICO PAVILION | Lime Frozen Margarita from La Cantina de San Angel. Also enjoyable from my seasoned Southwestern perspective – the frozen margarita! This sweet drink may look innocent, but it was strong, AND it was big enough to share! Bonus! There you have it, friends! 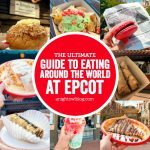 Our Guide to Drinking Around the World at EPCOT in Walt Disney World! Did I have ALL of your favorites on the list – or what am I missing? I’d really love to know as we’re headed back there next month. Can’t wait to check off a few more must-haves from our list! This is a great list. Makes me want to go to Disney now!